Germaine Dermoz (1888–1966) was a French film and theatre actress of the early-to-mid twentieth century. She is most famous for her portrayal of Madame Beudet in Germaine Dulac's avant-garde film La souriante Madame Beudet/The Smiling Madame Beudet (1923). 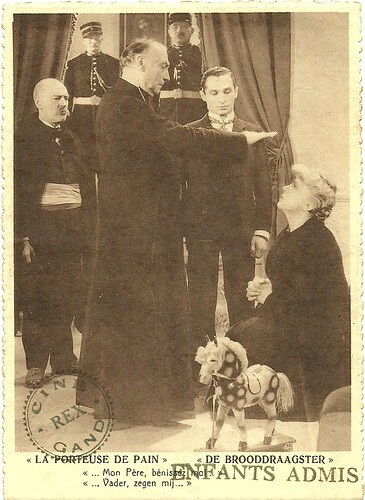 French postcard in the Nos artistes dans leur loge series, no. 210. Photo: Comoedia. 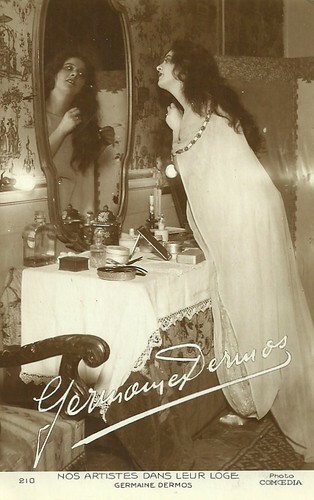 While this card shows a spelling of 'Dermos' with an -s in the caption and the signature, identical cards show a caption with 'Dermoz' with a -z. No trace of any actress with the name of Germaine Dermos can be found, so this has to be Dermoz. Germaine Dermoz was born as Germaine Deluermoz in 1888 in Paris. She was the younger sister of Jeanne Delvourmoz, aka Jeanne Delvair (1877-1949), actress at the Comédie-Française. Their brother was animal painter Henri Deluermoz (1876-1943), illustrator, among others, of one of the first French editions of Jungle Book by Rudyard Kipling. Germaine acted on stage with Gabrielle Réjane and stayed with Réjane’s troupe between 1907 and 1909. 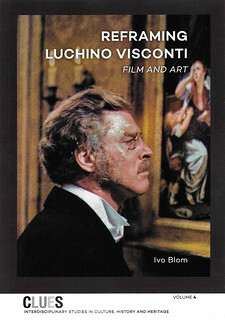 She also acted with Firmin Gémier. Her many theatrical tours led her, before the First World War, as far as Argentine and Russia. Dermoz recounts in her memoirs the perilous conditions in which one day she and her comrades had to cross the Cordillera of the Andes on the back of a donkey, on the side of a mountain on narrow paths, resigning themselves to throwing a part of their costumes on the snowy slopes. In St. Petersburg, she played before Tsar Nicholas II and suffered the first shots of the October 1917 revolution. Contrary to some assertions, she never belonged to the Comédie-Française. In 1908, Dermoz acted in the Gaumont film Méprise/Misunderstanding (Maurice de Féraudy, 1908), followed by a few more shorts by Maurice de Féraudy. 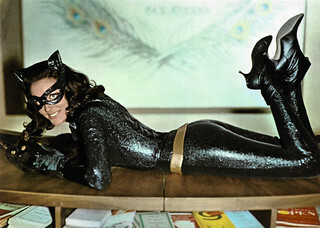 Soon she would also play in films by Pathè, Éclair and Eclipse. She was especially active in the historical genre, such as in Dragonnades sous Louis XIV/The Dragoons Under Louis XIV (1909), Beethoven (1909) with Harry Baur, Eugénie Grandet (1910), and Le roi Philippe le Bel et les templiers/King Philip the Fair and the Templars (1910), which were all directed by Victorin-Hippolyte Jasset for Éclair. She also appeared in La mort du duc d'Enghien en 1804/The Death of the Duke D'Enghien (Albert Capellani, 1909), La fin d'un tyran/The end of a tyrant (Georges Le Faure, 1909), and La duchesse de Langeais/The Duchess of Langeais (André Calmettes, 1910), for Pathé, and L'assassinat d'Henri III/An Eye for an Eye; or, The Last Days of King Henry III of France (Henri Desfontaines, Louis Mercanton, 1911), Olivier Cromwell (Henri Desfontaines, 1911) with Jules Berry, and Milton (Henri Desfontaines, 1911) for Eclipse. After the Éclair film Le mystère de Notre-Dame de Paris/The Mystery of the Notre-Dame Bridge (Emile Chautard, Victorin-Hippolyte Jasset, 1912), Dermoz mostly acted in Pathé productions. Several were directed by Adrien Caillard, such as Les trois sultanes/The Three Sultans (1912), Zaza (1913), an adaptation of the play by Pierre Berton and Charles Simon, and L'héritage de Cabestan/Harding's Heritage (1913). At Pathé, Dermoz often acted together with Henri Étievant and Jeanne Grumbach, as in L’absent/A Dutch Love Story (Albert Capellani, 1913), and Le petit Jacques/Little Jack (Georges Monca, 1913). 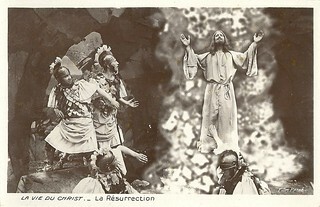 French postcard by Edition Pathé Frères. Photo: Félix. After 1914, Germaine Dermoz took a break of the set. During the First World War, Pathé drastically reduced fiction film production. In 1918 Dermoz returned with the Pathé film La masque de l’amour/The Mask of Love (René Plaisetty, 1918) with Mévisto and Jeanne Grumbach, and she had the female lead in the Honoré de Balzac adaptation La marâtre/The stepmother (Jacques Grétillat, 1918). Other adaptations followed such as L'énigme/The riddle (Jean Kemm, 1918) after Paul Hervieu, Fanny Lear (Robert Boudrioz, Jean Manoussi, 1919), after the play by Ludovic Halévy and Henri Meilhac, Les cinq gentlemen maudits/Five Doomed Gentlemen (Luitz-Morat, Pierre Régnier, 1920) after André Reuze, Petit ange/Little Angel (Luitz-Morat, Pierre Régnier, 1920) after Alfred Vercourt and with Régine Dumien. If it were necessary to point out a single film of that period, though, it would undoubtedly be the masterpiece of Germaine Dulac, La souriante Madame Beudet/The Smiling Madame Beudet (1923), a feminist manifesto and typical avant-garde production. The film deals with an intelligent woman trapped in a loveless marriage with a man (Alexandre Arquillière), who always points an unloaded revolver at his head for fun. Sick of him, she loads the gun, but repents and tries to empty the gun. Yet, the man seizes the gun first and points it at her. In her memoirs, Dermoz recounts the apprehension that had seized her when the film was broadcast forty years later on French television and surprised to find that her play did not have the dreaded exaggeration and grotesque that characterised a part of silent film acting. After the female lead in the operetta film La course du flambeau/The Torch Race (Luitz-Morat, 1925), which she had performed on stage in 1907, Dermoz’s silent film career ended. Between the two wars, she preferred to devote herself almost exclusively to the theatre. She played on the biggest Parisian stages, and enjoyed successes in contemporary plays by André Josset, Henri-René Lenormand, Charles de Peyret-Chappuis and Jean Cocteau. In 1938, Germaine Dermoz created the character of Yvonne in Les Parents terribles by Jean Cocteau, with Gabrielle Dorziat and the very young Jean Marais. The play was directed by former actress Alice Cocéa, and performed at the Théâtre des Ambassadeurs in Paris. Dermoz replaced almost instantly Yvonne de Bray for whom the role had been written but who, because of a serious heart problem, was no longer able to play. 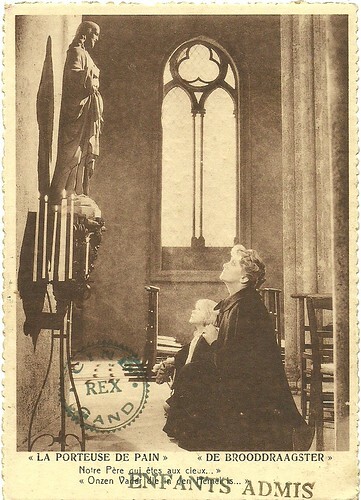 Belgian postcard for the Ghent cinema Rex. 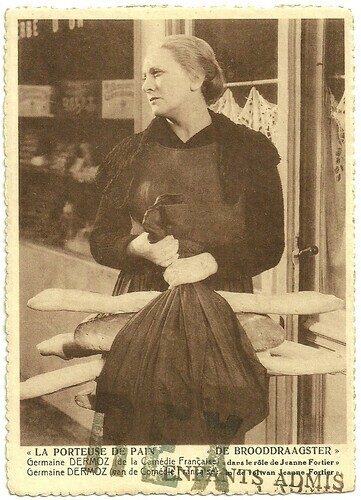 Photo: publicity still for La porteuse de pain/The Bread Peddler (René Sti, 1934) with Germaine Dermoz as Jeanne Fortier. Belgian postcard for the Ghent cinema Rex. Photo: publicity still for La porteuse de pain/The Bread Peddler (René Sti, 1934) with Germaine Dermoz as Jeanne. Caption: "Follow me Jeanne, soon I'll be rich". Collection: Didier Hanson. Germaine Dermoz led a more relaxed film career, accepting shooting proposals only if they did not compromise her commitments to the theatre. When sound film set in in France she returned to the film set for supporting parts in Jacques de Baroncelli’s Alphonse Daudet adaptation L'Arlésienne (Jacques de Baroncelli, 1930), starring Blanche Montel, and Le rêve/The Dream (Jacques de Baroncelli, 1931) after Émile Zola. Dermoz had the lead as Madame Kampf in Le bal/The Ball (Wilhelm Thiele, 1931), in which she played a middle-class woman who just like her husband (André Lefaur) turns into a snob when an inheritance looms. Their daughter (Danielle Darrieux in her first film role) torpedoes the plans when she throws all the invitations to the ball her parents organise in the Seine. The film was shot in a German version too by Thiele, Der Ball. After the court case drama Le crime du chemin rouge/The Crime of the Red Road (Jacques Séverac, 1933), in which a lawyer (Marcel Vibert) suspects his wife (Dermoz) of murder, Dermoz had an endearing part in La porteuse de pain/The Bread Peddler (René Sti, 1934), as an innocently imprisoned woman, who after twenty years of hard labour, evades and goes to Paris where she survives as bread peddler. She finds back her children one by one, after which she unmasks the culprit, Jacques Garaud (Jacques Grétillat). By now Dermoz often played mature roles, as Annabella’s meddling mother in Les nuits moscovites/Moscow Nights (Alexis Granowsky, 1934), the wife of Fernand Charpin in the Mauriac adaptation Les anges noirs/The Black Angels (Willy Rozier, 1937), the wife of Raimu in Le héros de la Marne/Heroes of the Marne (André Hugon, 1938), Maria de Medici in Remontons les Champs-Élysées (Sacha Guitry, 1938), the mother of Katia Lova in La vie est magnifique/Life is magnificent (Maurice Cloche, 1939), the mother of Jean Chévrier in the smugglers drama Andorra ou les hommes d’airain/Andorra or the Bronze Men (Émile Couzinet, 1942), and Raymond Rouleau’s mother and Constant Rémy’s wife in Monsieur des Lourdines (Pierre de Hérain, 1943) after Chateaubriant. After the war, Germaine Dermoz was Queen Anne of Austria in Monsieur Vincent (Maurice Cloche, 1947) on St. Vincent de Paul, played by Pierre Fresnay. In the comedy Le Rosier de Madame Husson/The Rosier of Madame Husson (Jean Boyer, 1950), after Guy de Maupassant’s classic tale, she leads a group of charitable ladies searching for a chaste girl, who will win a big sum of money. By lack of a chaste female they select a man (Bourvil), who, though, proves to be weak against female seductions. In Poil de carotte/Carrot Top (Paul Mesnier, 1952), she was the ill-doing, hateful mother of the protagonist (Christian Simon). After a few minor parts, Dermoz almost made full circle with her early historical films when playing Catherine de Medici in Si Versailles m’était conté/If Paris Were Told to Us (Sacha Guitry, 1955), though two more minor parts followed. Dermoz’s last film part was in the spy comedy L'Honorable Stanislas, agent secret/The Reluctant Spy (Jean-Charles Dudrumet, 1963) as the mother of Stanislas (Jean Marais). Her stage career had already ended in the mid-1950s. After a first marriage, Germaine Dermoz married in second wedding the actor Jean Galland, whom she then divorced. From her first marriage, Germaine Dermoz had a daughter, Claude, and from her second, another daughter, Anne-Marie. She was also, by her first marriage, the aunt by marriage of the actress Annabella, called "Zette" for the intimates, with whom she maintained affectionate ties until the end of her life. The journalist Hélène Lazareff, comedian Noël Roquevert and his wife, and the actress Paulette Noizeux were among the close friends of Germaine Dermoz. 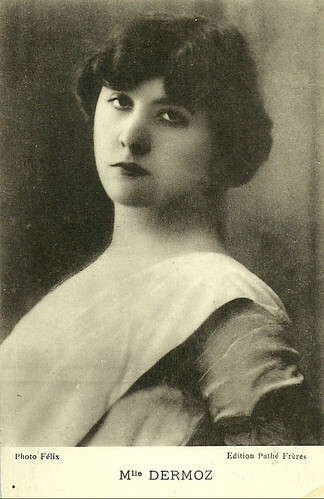 Germaine Dermoz died in 1966 in Paris. 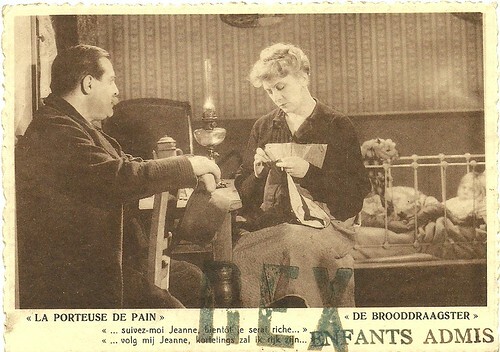 Belgian postcard for the Ghent cinema Rex. Photo: publicity still for La porteuse de pain/The Bread Peddler (René Sti, 1934) with Germaine Dermoz as Jeanne. Caption: "Our father who art in heaven". Collection: Didier Hanson. Belgian postcard for the Ghent cinema Rex. Photo: publicity still for La porteuse de pain/The Bread Peddler (René Sti, 1934) with Germaine Dermoz. Caption: "Father, bless me". Collection: Didier Hanson. Source: Wikipedia (French and English) and IMDb. Hello, my Friend! I have missed your comments on PPF! But setting that aside, I LOVE this post. I am SO amazed at the amount of research you do for each of your posts. This postcard is just lovely.